The history of this revered Danish melodic metal band is far too convoluted to recite here but most Fireworks readers will no doubt be familiar with their past anyway. 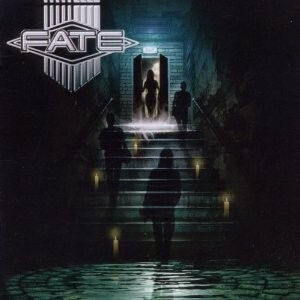 Even since their last album -- 2006's 'V' -- there have been changes to Fate's line-up: guitarist Soren Hoff and singer Per Johansson have gone and been replaced by Dagfinn Joensen and Torben Enevoldsen, respectively. The rest of the band is made up of drummer Jens Berglid, keyboardist Mikkel Henderson and bassist Peter Steincke who remains the band's sole original musician. 'Ghosts From The Past' is an excellent release and singer Joensen has done a great job, slipping into the role with ease. He's got a fine set of lungs indeed. There are some terrific melodies running through the album. 'Fear Of The Stranger' chugs a little bit but the album's standout rocker 'I Believe In Rock N Roll' makes up for the albums few minor flaws. The metal riffs and clean and crisp production gives 'Ghosts From The Past' its kudos. There's also a commercial side to the album which thankfully doesn't outsell the metal edge. The keyboard laden 'Daddy's Girl' will delight AOR fans while 'Murder' will keep the fans of harder music happy. Overall, I'd certainly say 'Ghosts From The Past' is an impressive album with a good selection of songs, some nifty melodies that run between AOR and metal, a strong production and above all else some fine musicianship from all five players.